More than 65 United Methodists from throughout the Louisiana Conference attended L.E.A.D. 2012-Catch and Release, held Nov. 2-3 at The Wesley Center in Woodworth. The leadership workshop focused on “catching” seekers, helping them become disciples and then releasing them into the world to serve others. The keynote speaker for the two-day event was Rev. Dr. Marvin Anthony Moss, pastor of Cascade United Methodist Church in Atlanta. 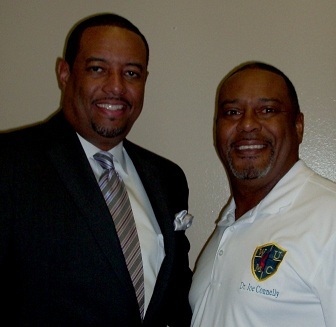 Pictured with Dr. Moss is Rev. Joe Connelly, event organizer.